I loooove paper crafting. I’m not crafty, in general. But cards and scrap booking … ah. Useful, pretty, AND fun. Then I had kids. Nuh uh. Goodbye paper crafting. The only time I have for such a thing is after the kids are asleep and I haven’t the energy for it. However, now Kayla is 5 and wants to do crafts with me. So I just need to simplify the projects so they don’t take the whole day. 1. 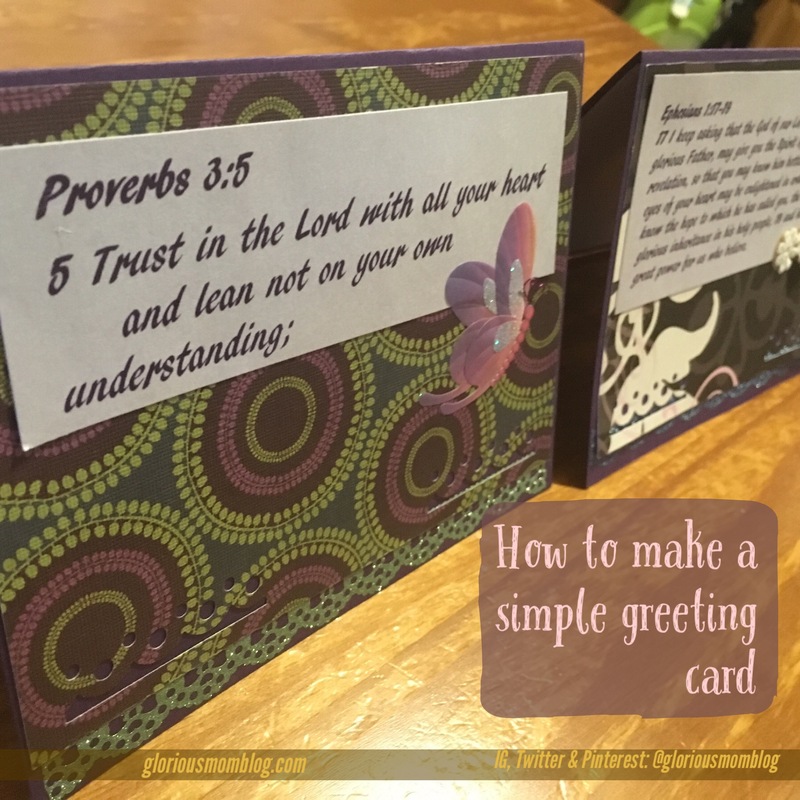 Print the text you want on the front of the card on one of the pieces of colored card stock. 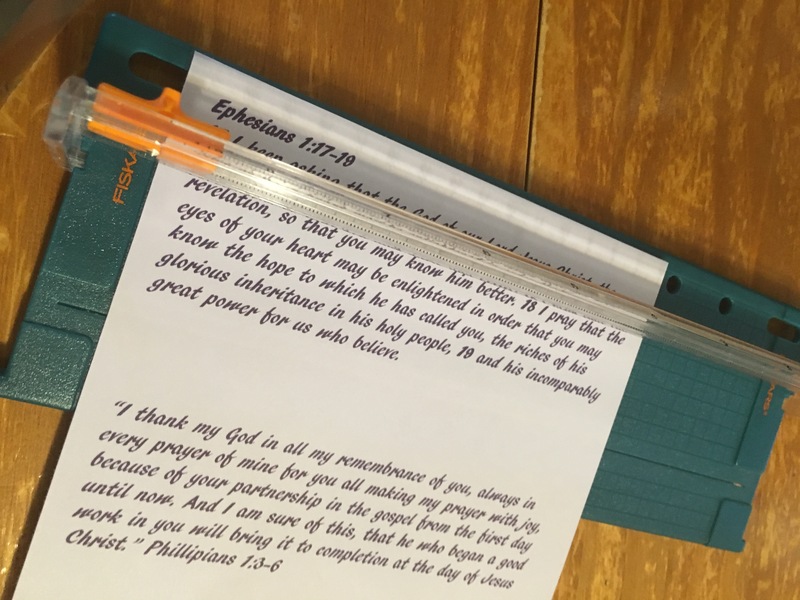 I used scripture, but you can also find quotes online or write your own text. You don’t want the printed text too wide. It should be .5″ shorter or more than your patterned paper once cut to size. You have to make sure the card fits! So after measuring the dimensions of the envelope, take away about a half inch from each side to determine the card dimensions. Then you will double one of those dimensions as you are folding your card. For example: the envelope I have listed has dimensions of 7.25×5.25. Subtracting a half inch gives you 6.75×4.75 for your card. If you want it to fold over, doubling the shorter dimension gives you a landscape setup, so 6.75×9.5. Fortunately, that fits in a standard 8.5×11 paper! You gotta check. 3. 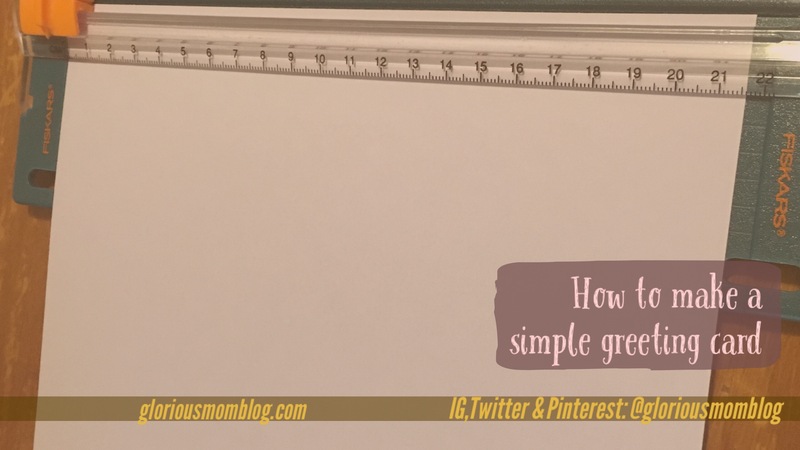 Cut the card stock you want for your card base using these dimensions with the paper trimmer. If your paper trimmer is small, you may need to subtract 11-9.5 and cut the 1.5″ from your paper instead of the 9.5″. Fold your card stock in half after cutting to size. 4. Measure, cut, and place the washi tape. Place it on the bottom of the front of the card. 5. 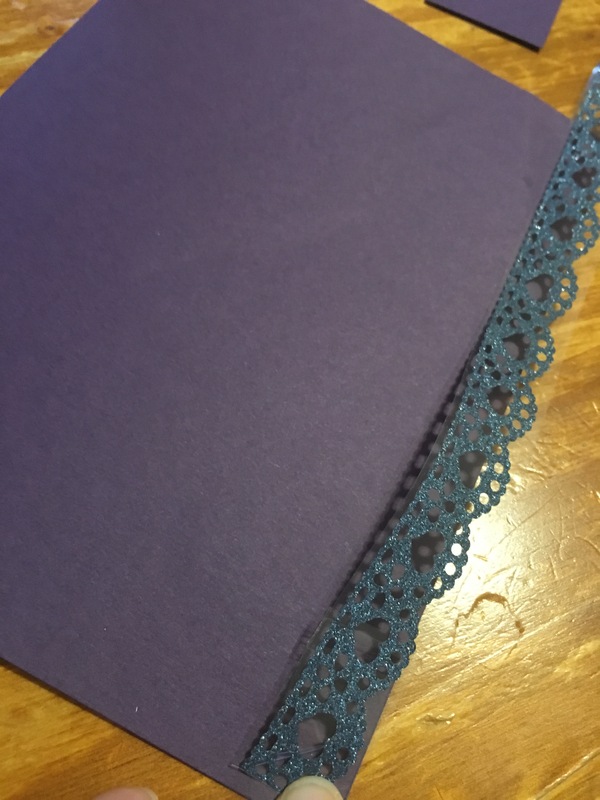 Cut the patterned paper, leaving a margin of .25″ on the sides and top and .5″ on the bottom. You can glue this on the front of the card. It should rest just slightly over the top of the washi tape. 6. Trim the card stock with the printed text. You can glue this on top of the patterned paper. Leave a .25″ margin from the patterned paper on the front and sides, leaving more space at the bottom. 7. 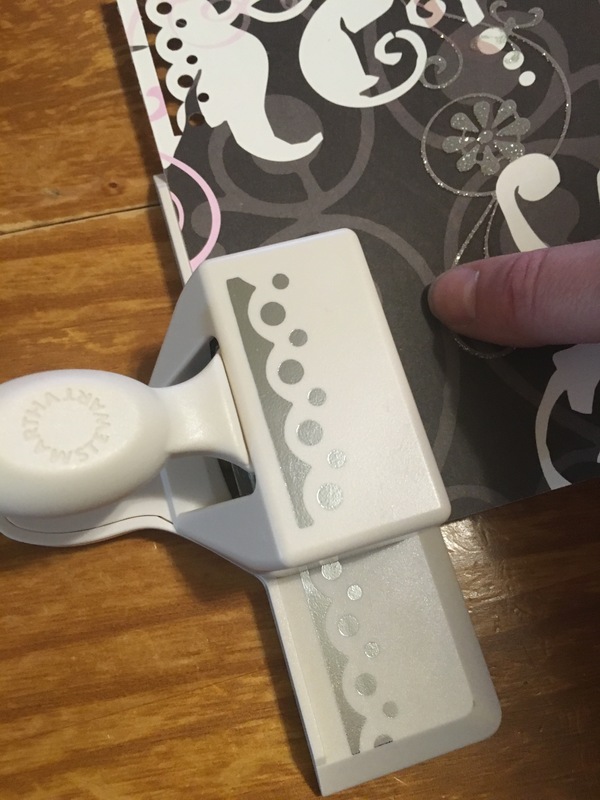 Decorate the bottom of the front of the card using the edger punch. I aligned the punch to each edge because that seemed to work well with both the size of my paper and the type of punch. You want the paper from the inside of the card to show through after you punch. 8. Use a dimensional sticker to embellish the front. 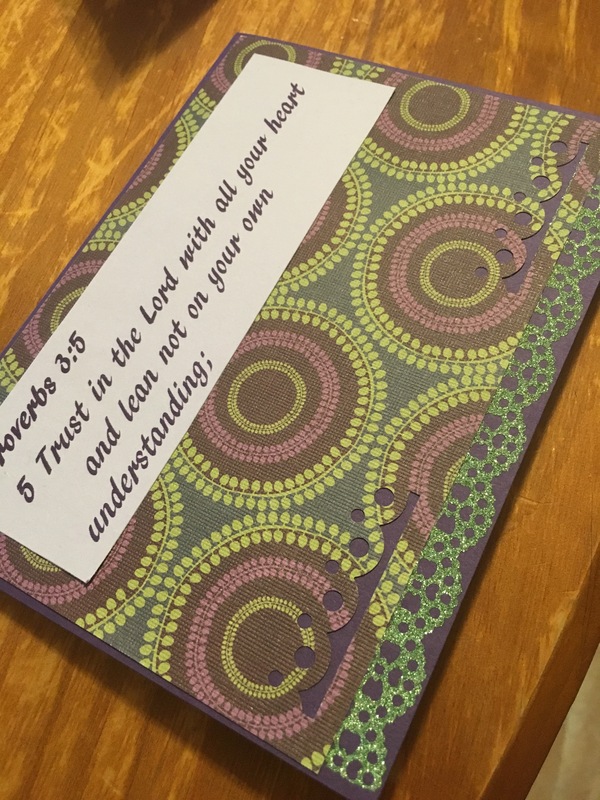 I placed mine halfway on the sheet with the text and the patterned paper since it seemed to balance the card well. 9. 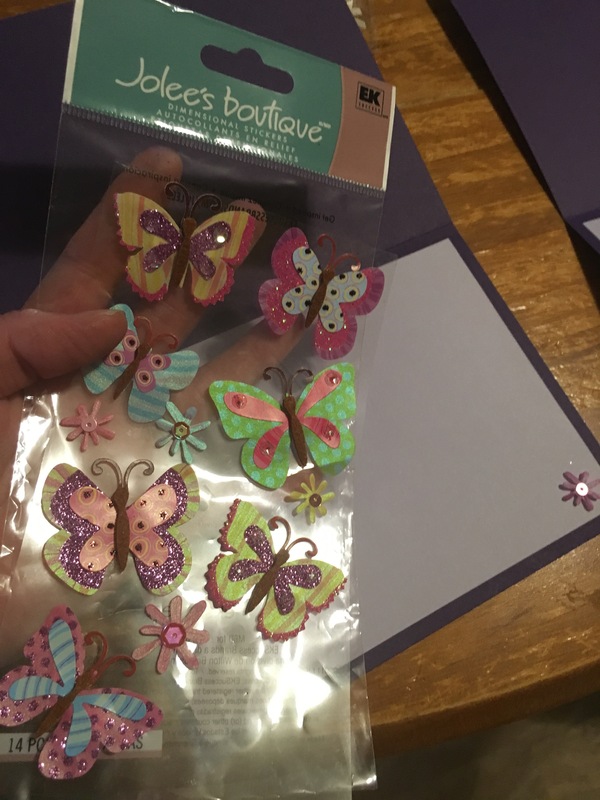 Cut the card stock to line the inside of the card. Whatever your card dimensions, subtract .25″ from each side to leave a margin. Glue and center carefully. 10. Pick a small sticker to accent the inside of the card. I put it on the lower right. 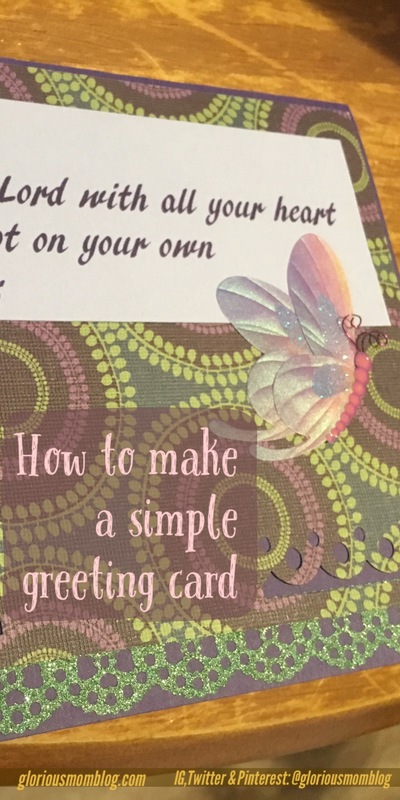 It takes a little practice to get it perfect, but it’s so much more heartfelt to give a homemade card than a store-bought one. Plus, you can get your money back from crafting supplies with the money you save from NOT buying greeting cards! Thanks! This was my first craft post. I wasn’t sure how it would go over. That’s so super pretty but my patience for crafty stuff doesn’t seem to exist heh. And who has time, right? It’s a special treat for me. This is great – the photos are super helpful! This is totally more heartfelt than a store bought card. Don’t tell but I tend to just throw cards in the trash. I would have to keep something that was handmade for me though! I love doing this kind of stuff. But I haven’t since the munchkin was born. I will have to start doing projects again in the future. Cute! I still love sending and receiving real cards, it’s becoming a lost art! I am SO with you… not crafty but when it comes to making cards and scrap booking I totally love it! If only I had the time. (sigh) This card is super cute!